With decades of experience and many different applications, the SSX 100K (45,360 kg)/Leg Falsework and Shoring System is the optimum system available in the world for use when temporary support is needed during the construction of concrete and steel structures. By the use of 10' (3.05M), 15' (4.60M) and 20' (6.10M) long Single Leg/Rotatable Brace system, the contractor will have the choice of three Tower "footprints" ... 10' x 10' (3.05 M x 3.05 M); 10' x 8' (3.05 M x 2.44 M) and 8' x 8' (2.44M x 2.44M). 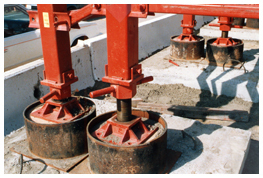 System offers a complete range of shoring height adjustments, ideal for applications when high, heavy loads occur. Each Staff is fully braced, and are independently adjustable, with no decrease in allowable safe load. All connections are pinned. Jacks are self-leveling. Equipment is designed to be easily stored, shipped, erected and dismantled, requiring no special shipping permits. Great for all Civil Engineering Projects requiring temporary support of high loads. A very important benefit when using the SSX - 100K/Leg Falsework & Shoring System is the design of the Extension Staff &Top Jack Assembly. 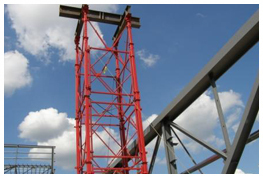 The Extension Staff & Top Jack Assembly will allow structural steel elements to conveniently pass between the Staffs unobstructed, while allowing steel above to be blocked and supported. See photograph that clearly illustrates this feature that will save a great amount of time, labor and material costs, including the possibility of cutting the Falsework equipment to facilitate the removal of the Falsework & Shoring Towers. 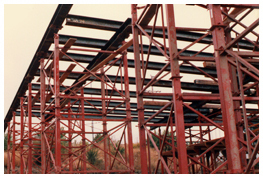 Photo illustrates long span Steel Trusses designed with Tension Members beneath the Bottom Chord of the Trusses. Notice how the Tension Members are able to pass between the Staffs and allows the Bottom Chords to be blocked with steel grillage beams. Heavy Duty "C" Clamps (furnished by contractor) are normally used to clamp the Steel Grillage Beams to the Plate Heads of the Top Jacks. (Beam Clamps are not furnished by SCI unless as special order). It should be noted that some of the Accessory Equipment such as the Assembly Fixture, Wrenches, Knee Braces & Beam Clamps, etc. indicated within these pages will be available only with special order. Please enquire when placing orders.